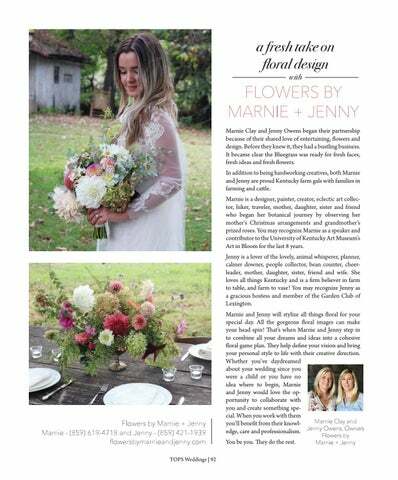 FLOWERS BY MARNIE + JENNY Marnie Clay and Jenny Owens began their partnership because of their shared love of entertaining, flowers and design. Before they knew it, they had a bustling business. It became clear the Bluegrass was ready for fresh faces, fresh ideas and fresh flowers. In addition to being hardworking creatives, both Marnie and Jenny are proud Kentucky farm gals with families in farming and cattle. Marnie is a designer, painter, creator, eclectic art collector, hiker, traveler, mother, daughter, sister and friend who began her botanical journey by observing her mother’s Christmas arrangements and grandmother’s prized roses. You may recognize Marnie as a speaker and contributor to the University of Kentucky Art Museum’s Art in Bloom for the last 8 years. Jenny is a lover of the lovely, animal whisperer, planner, calmer downer, people collector, bean counter, cheerleader, mother, daughter, sister, friend and wife. She loves all things Kentucky and is a firm believer in farm to table, and farm to vase! 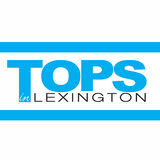 You may recognize Jenny as a gracious hostess and member of the Garden Club of Lexington. Marnie and Jenny will stylize all things floral for your special day. All the gorgeous floral images can make your head spin! That’s when Marnie and Jenny step in to combine all your dreams and ideas into a cohesive floral game plan. They help define your vision and bring your personal style to life with their creative direction. Whether you’ve daydreamed about your wedding since you were a child or you have no idea where to begin, Marnie and Jenny would love the opportunity to collaborate with you and create something special. When you work with them Marnie Clay and you’ll benefit from their knowlJenny Owens, Owners edge, care and professionalism. You be you. They do the rest.